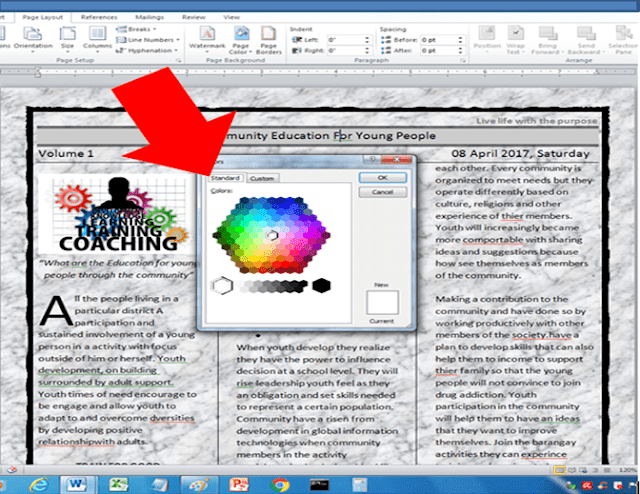 Using Microsoft Word 2010 you can enhance the beauty of your document's background. Providing that you want to create a special document like magazine, certificates, stickers, or any documents that you need to enhance the background using more colors, fill effects like gradients, texture, pattern, or using a beautiful picture as document's background. Learn this application using below instructions provided with poster images to help you easily learn. 1. APPLY STANDARD COLOR- you can apply different colors using the color palette, standard means you can't change the color standard. Once your document is open or you start creating your document, all you need is to click PAGE LAYOUT MENU/ CLICK PAGE COLOR/ MORE COLORS/ CLICK STANDARD/ THEN YOU SELECT/CLICK THE COLOR YOU LIKE. Then click ok to apply the color you select. 2. APPLY CUSTOM COLOR- custom color means you can change the color standard using the color palette color handle, sliding bar, or change the color model, the percentage of red, green, blue number located at the drop/down bar. You can click PAGELAYOUT/ PAGE COLOR/ MORE COLOR/ CLICK CUSTOM. Once the active windows called colors, you can point your mouse in color handle, then drag your mouse in the color you like. Then you can adjust the percentage of the color using the sliding bar at the right side. Or change the color model from RGB to HSL to change the color percentage of Hue, Sat, and Lum. Then click Ok to apply in your template. 3. APPLY FILL EFFECTS USING GRADIENT COLOR- gradient color is a combination of either 1 and 2 and presets of color and change the SHADING STYLE. 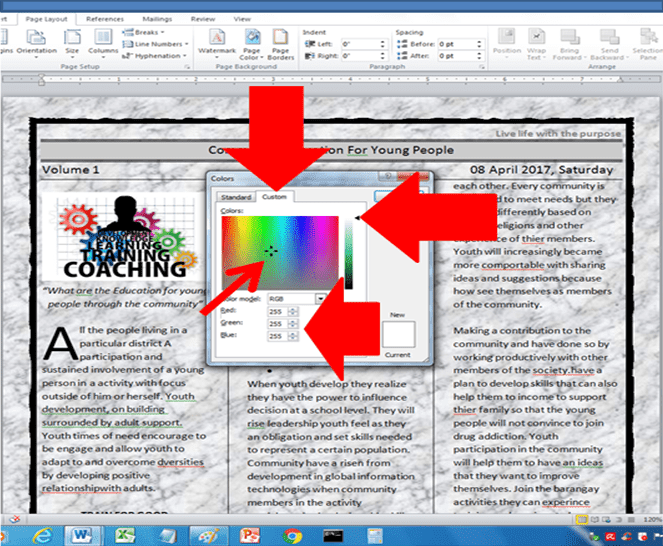 Click PAGE LAYOUT MENU/PAGE COLOR/FILL EFFECTS, once the fill effects windows pop-up, click GRADIENT, select either one color, two colors, or presets. If two colors you selected on the right side of it click the drop/down bar of color 1 and color 2. Then select your SHADING STYLES. 4. 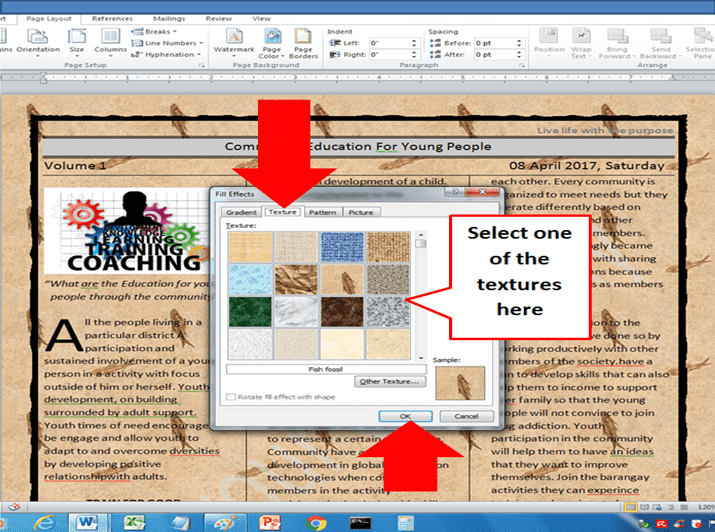 APPLY FILL EFFECTS USING TEXTURE- texture is a pre- designed templates located at the center. A different enhance background like DENIM and PAPYRUS and more. And also you can insert your own texture your design. 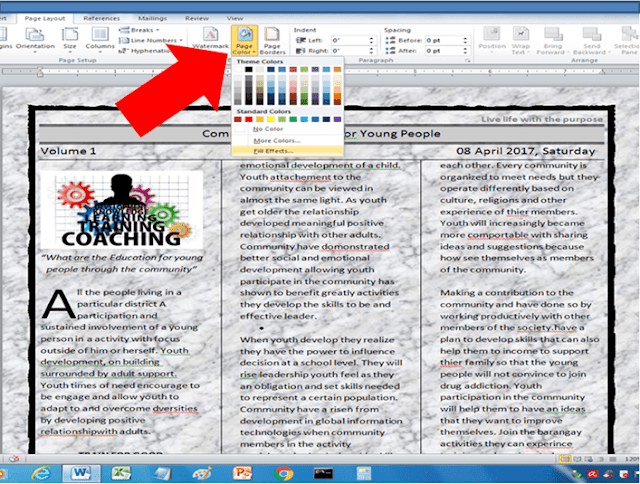 Click PAGE LAYOUT MENU/PAGE COLOR/FILL EFFECTS/once the Fill Effects window pop-up, click TEXTURE then select and click a design. Then click Ok to apply or you can insert your own texture design using the Other Texture button position right side down. 5. 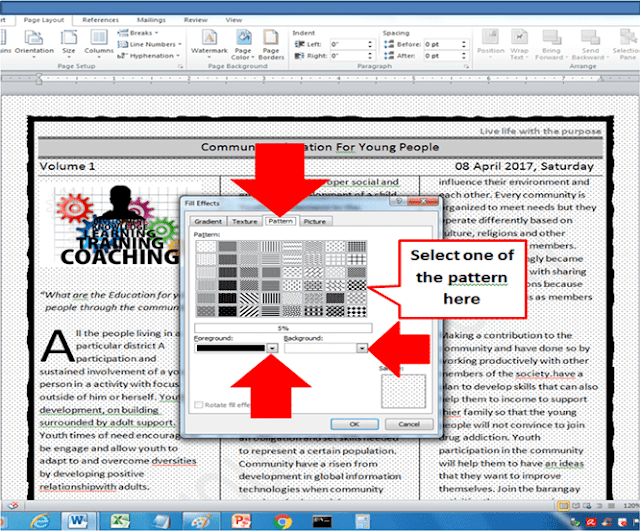 APPLY FILL EFFECTS USING PATTERN- pattern is also a pre- designed templates, you can adjust the foreground and background color of your document templates. Click PAGE LAYOUT MENU/PAGE COLOR/FILL EFFECTS/once the Fill Effects window pop-up, Click the PATTERN, then select a pattern design and adjust the foreground and background color using the drop/down bar. Then click Ok to apply. Click PAGE LAYOUT MENU/PAGE COLOR/FILL EFFECTS/once the Fill Effects window pop-up, Click the PICTURE then click SELECT PICTURE button below right. Because you own your picture or downloaded it, it's possible you stored it in a drive on your computer. 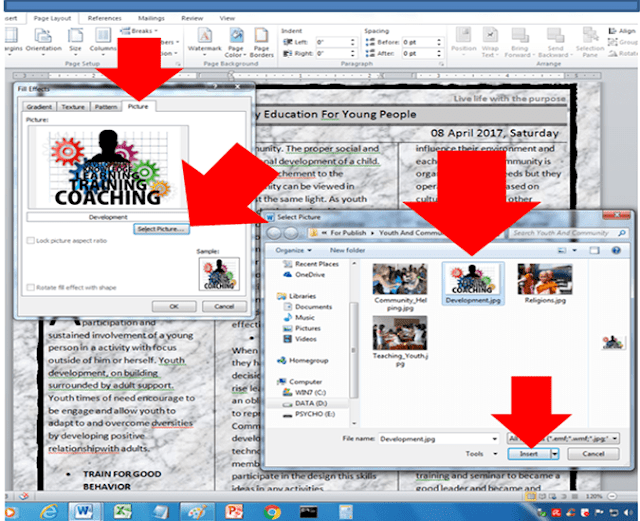 So it will open another active window called select picture. Now click the location drive like the drive d: then select your own picture, then click the INSERT button at the bottom of that active window. 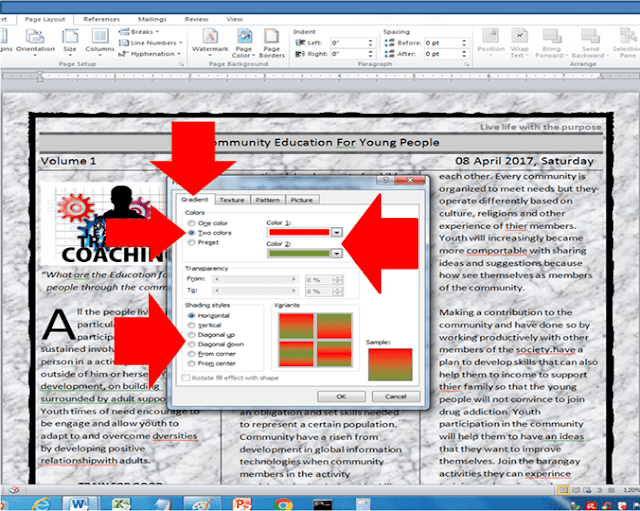 Using the this template background of your document, be sure that your text is visible, meaning apply a color that contradiction to the text color you apply. Like you apply the dark color of the text, then you apply also the black color as a color template background in your document. If you want an other application like this you can click the link below using the OTHER REFERENCES.